All Rates Include Breakfast and 21% Gov't Tax & Service Charge. No Hidden Charges. Rates valid until 31 Mar. 02 and subject to change without prior notice. Rates quoted on single/double occupancy basis. 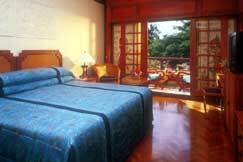 High season: 01 - 31 Aug. add US$18.15/night/room. Peak season: 20 Dec. - 06 Jan. Price to be advised.